Note: This is part two in a series of posts about Gatsby.js and WordPress. You can find Part One here, and Part Three here. 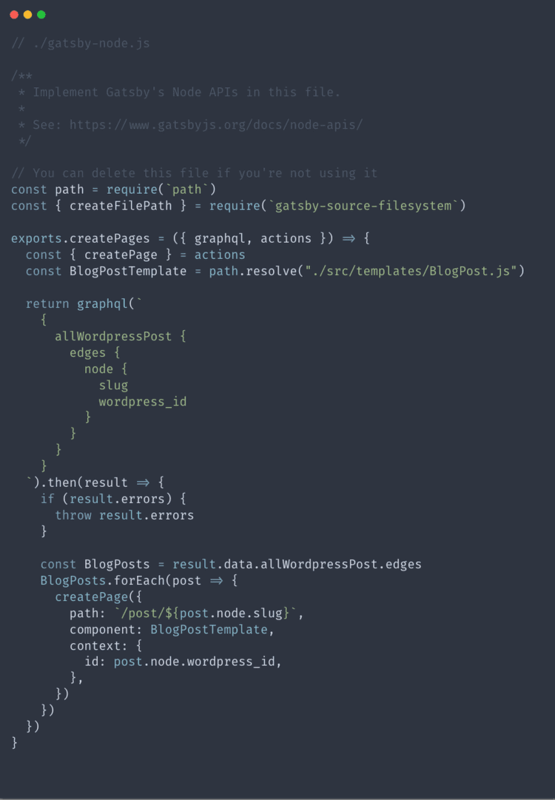 In the last post, we covered setting up WordPress for use with Gatsby. Today we will cover how to pull the data from WordPress into Gatsby and build pages. I have set up a wordpress site for us to use with the plugins mentioned in the last post as well as some dummy content for us to use. If you're curious, my favorite lorem generator is Fillerama which offers random content from Futurama, Monty Python, Star Wars, and more. This is where the content came from. 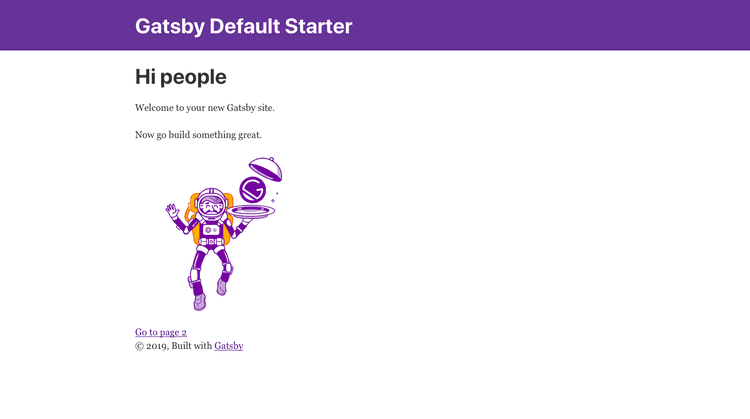 One of the nice things about Gatsby are the starter projects. These are available for most applications and setups including WordPress, although we won't be using that today. We will just be using the starter default so we can configure everything ourselves. In the future, it may be beneficial to take a look at the various starters and see if there's one that meets your needs. This can be a HUGE time saver and gives us the ability to get straight into the development portion without having to worry about configuration. Before we get into the code, let's talk about the Gatsby starter default. This project is the default (obviously) project that will be built when we create a new gatsby project with the cli. It comes with a few plugins, but not too much so it's wide open for customization. You can see there are several dependencies installed right off the bat. I'll just cover a few of them. Gatsby-Image creates an effect similar to Medium and also allows us to use responsive images and optimize our site. Gatsby-Transformer-Sharp is what creates the responsive and optimized images, then allows us to query for those through GraphQL. We also have Gatsby-Source-Filesystem which could be used to pull in markdown files for content, but we're using WordPress instead. 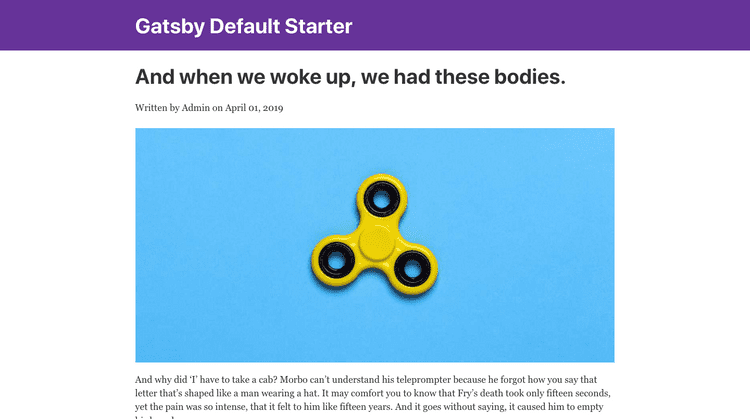 The last package I want to mention is Gatsby-Plugin-React-Helmet, which allows us to create meta tags for the site's head which helps with SEO. We will be running our Gatsby js site in development so we can see what we're doing. Kinda hard to fly a plane when we can't see where we're going, right? To do this, simply run the following command in the terminal and it will build the site in a development environment with hot reloading and more. The site provides a navbar with a link going back to the homepage. There is also a bit of content with a link to page 2 which then provides a link back to page 1. It's very simple, but already we can see how fast gatsby js is. Now that we know what's already installed and what it looks like to start, we can add the stuff we need to use WordPress with our site. Fortunately for us, Gatsby has a page on their site where you can see what plugins are available. We will be adding the following plugins to our site: Gatsby-Source-WordPress and Gatsby-Plugin-Sitemap. If the gatsby site is currently running, we need to stop it and restart it so it pulls in the new content from WordPress. It's important to know that while we can choose what information goes on what pages after our app is built, it will only pull content when it is initially run so changes in the source require a rebuild. You may notice that there are several drilldowns inside of the acf field. This is saying "hey, look for the acf field called feat_img and get the local, optimized versions of these images so we can use them". Gatsby also provides fragments which means inside of gatsby we could just put ...GatsbyImageSharpSizes instead of drilling down so far and gatsby will know what to do with it. Since we are seeing stuff on the right-hand side, it means that we are getting our data from WordPress, which is awesome! Now we need to tell gatsby what to do with the data, so let's talk about the gatsby-node.js file a bit. As we briefly discussed earlier, the gatsby-node.js file is there so we can build pages programatically from data. 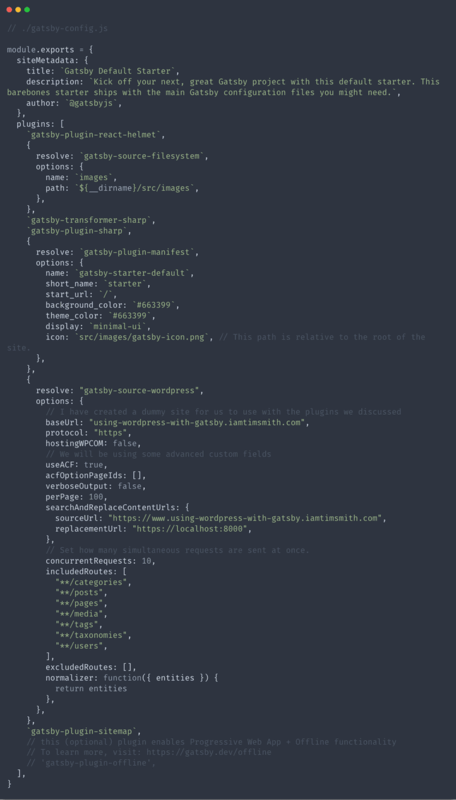 There are two pieces to make this work: the logic in gatsby-node.js and a template file to render the data. Let's start by creating a simple template with no dynamic data just to make sure our logic is working properly. Unless there is some special functionality needed for blog posts, we can just use a stateless functional component. I won't go over components in this post, but if you need a refresher, you can read up on components here. Below is the code I'm using for our template starter. This is just to make sure things are working after we finish setting up our gatsby-node.js logic. 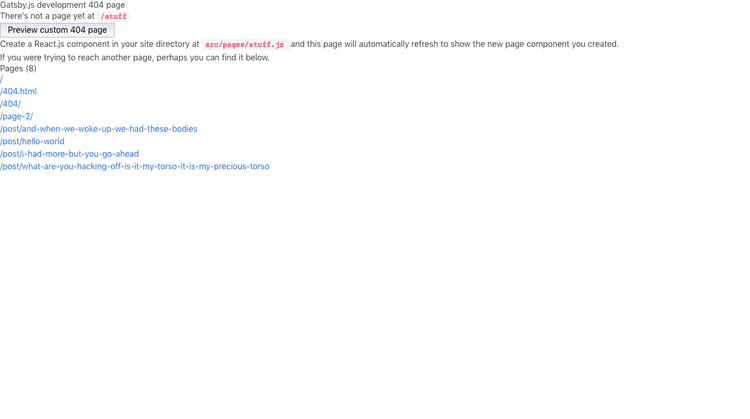 Once we know the page is being created, we will update the template to display correctly. Now let's talk about gatsby-node.js a bit more. Let's start off by discussing why we should use it. We have the ability to create pages and query information for a single blog post, which is very useful... sometimes. Imagine our blog had 100 blog posts and we have to develop a gatsby site to display all of them. Do we really want to go in and create a separate page for every single one of them? That would be A LOT of copying and pasting, not to mention a huge waste of time. 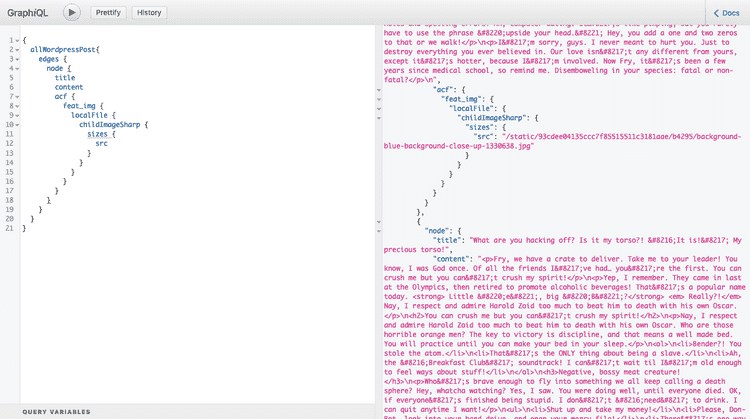 Gatsby-node.js allows us to pull in a template file, then query our data using graphql. Then we can loop through the appropriate data and programmatically create a page for each piece of data, in our case blog posts and pages. This template will be universal so all blog posts or pages look the same. We can also use different templates for different content types so our pages and blog posts don't have to look the same. 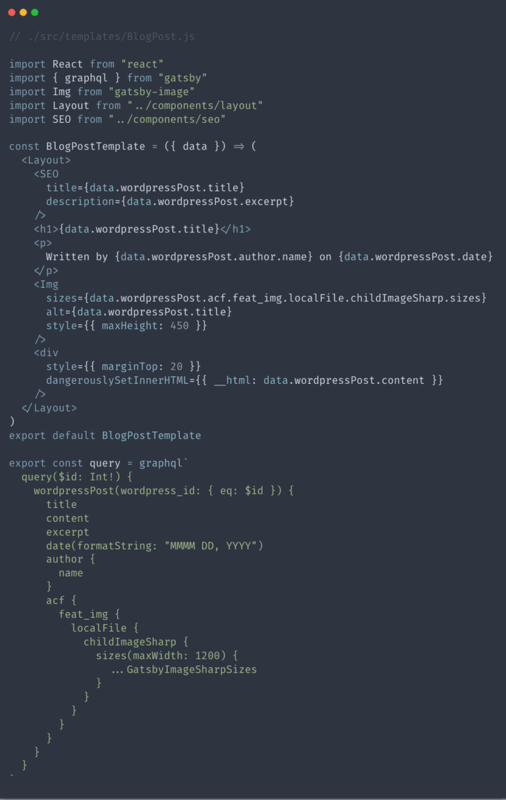 The code below pulls in the data for blog posts from wordpress and creates a page for each one using the createPage API provided by gatsby js. It is also much easier to pull in templates in this file using the path package, so I installed it using yarn add path. Just like before, we will need to restart our development server to see these changes take place. Let's go ahead and do that so we can make sure our logic is working correctly. The easiest way I've found (in development) to see a list of pages is to go to a route that doesn't exist, such as http://localhost:8000/stuff. We can now see all of the pages available and clicking on one should take us to the blog post template we created earlier that just shows Hello World. If this is what you're seeing, congrats! You're ready to move to the next section. Now that we have pages being created at the desired locations, we should update our blog post template to display the appropriate data. Although we need to make some changes, we will keep it as a stateless functional component. The code below will create our template. I would like to point out that we are using graphql to query the information which is then used as a prop called data. You may notice that there are a few components inside of our template that we didn't create. These come along with the gatsby starter default and can be modified as needed. The Layout component allows us to set a standard layout including header, footer, sidebar, etc on every page. Then we can just wrap our page inside that global layout without having to worry about importing everything inside of every template or page. The SEO component allows us to pass in dynamic data such as title, description, and keywords and the component will add those things to the head to improve our site's SEO score. I typically modify this component a bit so I can also pass in an image and I add a few properties to the meta, which allows twitter, facebook, and other sites to display a card like we expect with an image and everything. 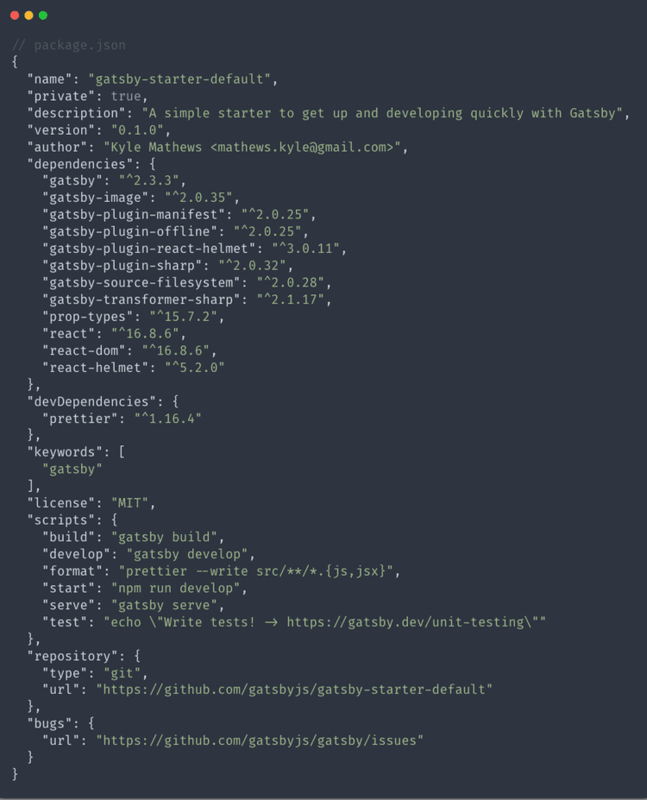 We're about half-way done with the actual Gatsby js build. 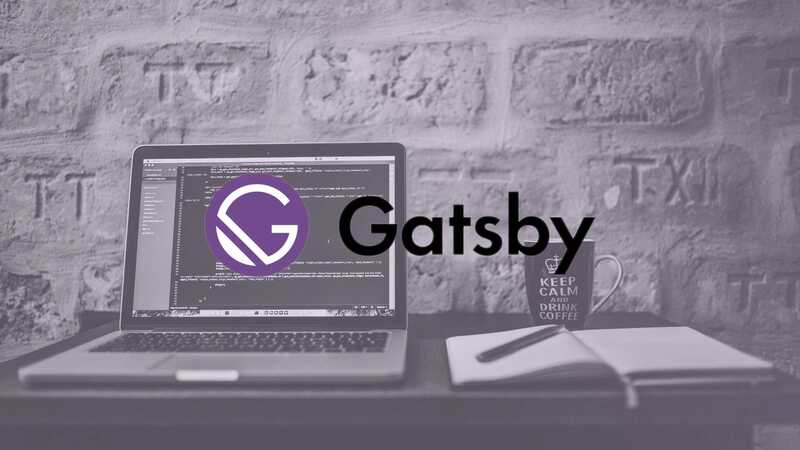 In this post we covered how to import blog posts from WordPress into our Gatsby js application and create pages automatically for each post. Honestly, this is the hardest part about making sites in Gatsby. If you're still keeping up, great job! If you're struggling, don't be too hard on yourself. This stuff is hard. If you need to, you can reach out to me on twitter @iam_timsmith and I'll be happy to help you. See you in How To Build A Blog with Wordpress and Gatsby.js - Part 3!